Danny Ritchie learned from a young age how to install and cap windows from his father, Albert. The youngster loved the work and in 1979, he and his brother Terry founded Ultimate Window Capping in Edmonton. 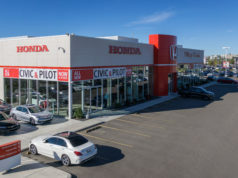 They quickly earned a reputation for providing a quality product and unbeatable customer service, and the company flourished. Ultimate Window Capping became Ultimate Exterior Renovators, a go-to company in Edmonton throughout the 1980s, and the company continues to grow and evolve in the central Alberta city today under the guidance of Marc Cloutier, the Edmonton office’s vice president. Ultimate expanded its operation when an act of God introduced the company to Calgary. 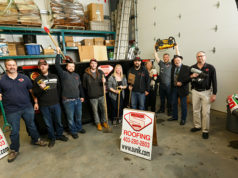 Ultimate started in Calgary with a crew of five roofers and seven siders who repaired one hail-damaged house per day. The company established itself as a leader in the business and attracted new clients seeking exteriors professionals for a variety of projects. It wasn’t long before another growth opportunity presented itself to the company. In 1995, a homeowner in Edgemont asked the company to do an addition over the garage before replacing the hail-damaged roof and siding, and Ultimate was all too happy to accommodate. “That was our first major renovation. Neighbours saw it and it started to snowball, so we became Ultimate Renovations,” he says. The company recently rebranded itself again with its foray into new home building in 2017, becoming Ultimate Homes & Renovations to reflect its dedication to all areas of the business. Ultimate is excited to enter this arena to apply their vision and experience to help produce clients’ dream homes. To further aid in this, Ultimate recently recycled a home to avoid the wasteful demolition of a perfectly good structure. Clients save money by selling their existing house (which is then moved to a new location) and Ultimate keeps the demolition debris out of the landfill. “Instead of knocking down this house we had the idea to save a lot of money and save the planet by picking up the house, moving it 200 kilometres north, and then building new. Now two people get new homes. It’s something we’re really trying to promote,” he says. The team tackles every job with the same eye for detail, adherence to budget and timeline, and quality standards – whether it’s a small bathroom remodel, a top-to-bottom renovation or a completely new home build. To maintain those high standards, the company uses tried-and-true in-house trades teams for their jobs. Everything from installation to construction to custom cabinetry are all kept in-house to ensure customers receive the impeccable service and quality upon which Ultimate was built. To consistently deliver these high standards, the Ritchie brothers have empowered their management team to bring in the best people, all the while being available to clients 24-7 themselves. Whether staff is actually related or not, there is an obvious family environment of respect and fun at their offices, as happy employees lead to happy clients. 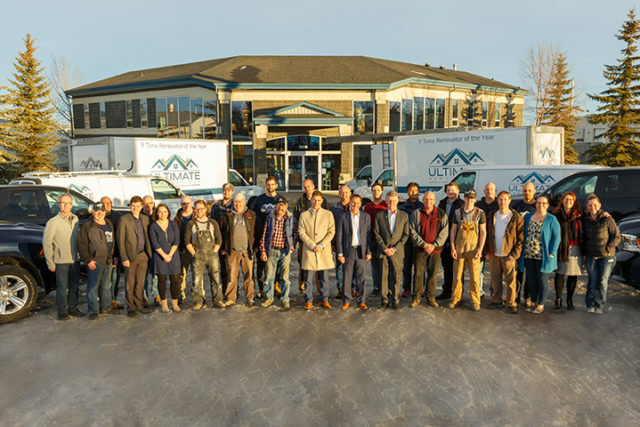 The corporate culture at Ultimate Homes & Renovations has contributed to the company’s success, and word-of-mouth advertising has helped it grow into one of the top renovation and custom home builders in Alberta. And the industry has certainly noticed. BILD has named Ultimate the renovator of the year nine times since the company started submitting projects for consideration in 1998. 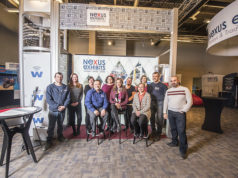 Since then, they have won 42 SAM Awards in a variety of categories including Best Home Renovation, Best Kitchen, Best Ensuite, Best Basement and Renovator’s Choice – and have been nominees or finalists in many others. “The Lake Bonavista show home won best kitchen, best basement, best ensuite, best all home. And I fell in love with it and couldn’t get rid of it,” Ritchie says of his current residence. The team pours their hearts and souls into every project they do and love to share their vision with clients and potential clients. Last September, they offered homeowners the Ultimate Outdoor Living Space Tour to promote what they can do to spruce up a yard. With the cooperation of past clients, the tour of six amazing southeast Calgary spaces aimed to inspire clients about the endless possibilities of outdoor living. Danny and Terry Ritchie have assembled a talented creative team who have brought their vision to life with every project they have done for the past 40 years, evolving and growing with the industry. As the company enters its fifth decade in Alberta, it’s clear the award-winning group at Ultimate is just getting started. Next articleConfederation – Why Would We Stay?